YEREVAN—The Armenian Parliament on Friday voted overwhelmingly to select Dr. Armen Sarkissian as the new president of Armenia, in a move that was widely anticipated given that since his nomination in January, he was endorsed by three out of the four factions represented in the legislature. With Ruling Party of Armenia, which nominated Sarkissian, the Armenian Revolutionary Federation and the Tsarukian bloc endorsing his candidacy, Armenia’s next president was named in a vote of 90 to 10. He is expected to assume office during a special session of parliament on April 9. “And I certainly expect your and our citizens’ support for and participation in our future important victories,” added the president-elect. Following the parliament voter Sarkissian met with President Serzh Sarkisian at the presidential compound, where the president offered his congratulations to the incoming leader. He also pledged that in the upcoming 40 days, his staff and other resources in his office, as well as the public officials for transition-related matters. YEREVAN (Reuters) - Armenia’s parliament chose Armen Sarkissian as the country’s new president on Friday in a vote that is meant to herald the start of a power shift to the country’s prime minister and parliament. PanARMENIAN.Net - The Armenian National Assembly on Friday, March 2 elected Armen Sarkissian as the country’s president to succeed Serzh Sargsyan, as the nation is making a transition from a presidential system of government to a parliamentary one. Out of the 105 lawmakers attending the session, 101 cas their ballots on Friday, with 90 MOs voting in favor and 10 voting against. The parliament can elect a president with a three-quarters majority under the terms of the amended constitution approved in 2015 in a referendum. Under the amended constitution, however, the presidency becomes largely ceremonial and power shifts to the prime minister and parliament. PanARMENIAN.Net - Russian president Vladimir Putin congratulated newly-elected president of Armenia Armen Sarkissian on Friday, March 2. In his message, Putin expressed hope that Sarkissian’s presidency will contribute to the development of Armenia-Russia relations and help deepen Eurasian integration. The Armenian National Assembly on Friday elected Sarkissian as the country’s president to succeed Serzh Sargsyan, as the nation is making a transition from a presidential system of government to a parliamentary one. Out of the 105 lawmakers attending the session, 101 cast their ballots, with 90 MPs voting in favor and 10 voting against. Because Serge can't run for a third time for president changed the constitution in order to retain power. We poor souls here are dreaming that corruption will end, who knows maybe someday. Serge leave politics, two terms are enough go and enjoy your wealth that you accumulated we don't need dynasties. Give other voices a chance! Armenian lawmakers have voted in a former Cambridge professor and envoy to the UK as the next head of state. The opposition is worried, however, that the departing president will find a way to stay in power. The Armenian parliament elected Armen Sargsyan – the only candidate considered by lawmakers on Friday – as its next president. The 64-year-old diplomat is set to take over after the current president Serzh Sargsyan steps down later this month. Armen Sargsyan previously taught physics at Cambridge University, served three terms as Armenia's ambassador to the UK and filled other key diplomatic posts across Europe. The president-elect shares a last name with the strongman Serzh Sargsyan, but the two politicians are not related. Addressing the lawmakers after the Friday vote, Armen Sargsyan said he would use "all his knowledge and experience" to serve Armenia. "I expect your contribution and participation, as well as contribution and participation of all citizens in the import victories of the future," he said. The new president is set to see his powers severely limited as the country implements a controversial constitutional reform in April. Under the reform initiated in 2015, the nation will transfer key elements of presidential authority to the prime minister, including the command of the army and the oversight of the security apparatus. The new president, who is set to stay in office for the next seven years, seems set to be reduced to a figurehead. The ruling party of Serzh Sargsyan has defended the changes as a way to boost democracy and improve the division of powers among the branches of government. The party says the constitutional amendments will grant more "levers" to the opposition. Old leader to stay on? 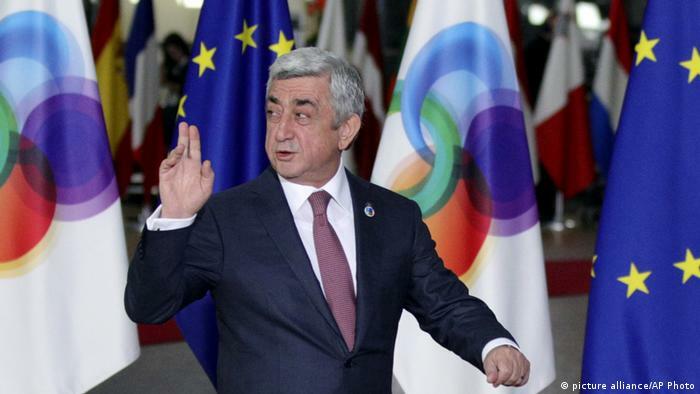 The government opponents, however, claim the reform is simply aimed at allowing President Serzh Sargsyan to maintain power by switching to the post of prime minister. They also accuse the government of influencing the outcome of the 2015 referendum that ushered in the reform. Serzh Sargsyan has hinted he would "remain active" politically after stepping down. The current leader is a former military officer who served as prime minister from 2007-2008, before winning his first term as president. Some of his supporters say he would be the best candidate to return to the post, praising his experience in navigating the Nagorno-Karabakh conflict with Azerbaijan. Edited by Yervant1, 03 March 2018 - 10:00 AM. Tired of dreaming barekam, even a nightmare comes to an end. Don't they have sense of dignity and honour or responsibility for motherland. Wake up Armenian people for a peaceful uprising. So ~ this is not the start of better times? This ~ you think will be ~ the same old ~ same old? Let me put it this way. Had we had a honest government devoid of corruption and embezzlement, we would be far better than we are now. Yes there is progress because of some hard working patriots who invest in Armenia against all the odds and difficulties, we should be much better than now. citizens, but we will certainly fulfill their will, "the deputy said. As expected, nothing new same old! YEREVAN. – After voting in favor of Armen Sarkissian who was nominated presidential candidate by incumbent President Serzh Sargsyan of Armenia, the Tsarukyan bloc has an unannounced decision to vote also in favor of prime ministerial candidate Serzh Sargsyan, according to Zhamanak (Time) newspaper. “Tsarukyan bloc head [National Assembly “Tsarukyan” Faction head, Prosperous Armenia Party Chairman, and tycoon] Gagik Tsarukyan has at least three reasons for such decision. “By Serzh Sargsyan’s suggestion, Gagik Tsarukyan supported Armen Sarkissian [as the next President], and now he cannot personally vote against Serzh Sargsyan’s candidacy [as the next PM]. “[Also,] Gagik Tsarukyan is grateful to Serzh Sargsyan for his [Tsarukyan’s] political rehabilitation, and he will repay for that by voting in favor [of Sargsyan]. “Besides, Tsarukyan is concerned that even if he himself decides that the bloc—led by him—shall vote against prime ministerial candidate Serzh Sargsyan, not all the MPs of the bloc will carry out that decision, especially since, unlike the presidential election which was secret ballot [in parliament], the election of Prime Minister is nominal,” wrote Zhamanak. Baron Sarksyan give others a chance, retire already and enjoy the plunder! Armenia's ruling party is set to nominate ex-president Serzh Sarksyan to be prime minister, the government's press service said on Monday. Armenia is in the process of shifting power to the prime minister after parliament chose a new president in March. "We have decided to propose to our party colleagues to keep an existing governing configuration and to submit the candidacy of Serzh Sarksyan as prime minister," the press service quoted Acting Prime Minister Karen Karapetyan as saying. The ruling party is expected to nominate Sarksyan at its party gathering on Thursday. Parliament, dominated by the ruling party, will make a final choice on April 17. 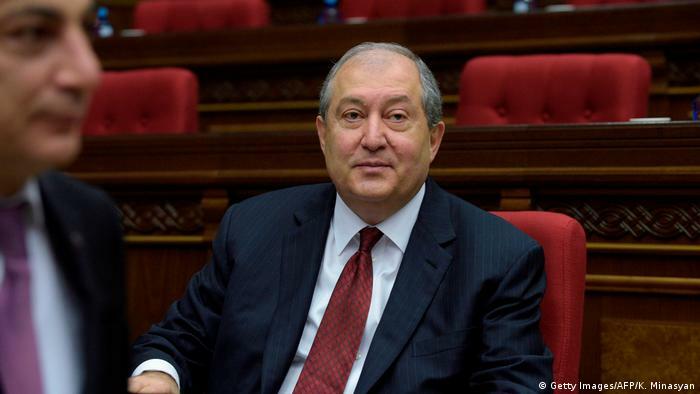 Sarksyan's ally - Armen Sarkissian, a former prime minister and ambassador to Britain - was inaugurated as president on Monday after being elected by parliament on March 2 in a vote that was meant to herald the start of a power shift to the prime minister and parliament. Under the terms of an amended constitution approved in 2015 by a referendum, the presidency is meant to become largely ceremonial. Opposition leaders have accused Sarksyan of changing the system to ensure he stays in power, and have been holding protest rallies in recent weeks. Hundreds of protesters gathered in the center of Yerevan again on Monday. Armenia, a country of around 3 million people in the southern Caucasus, seceded from the Soviet Union in 1991, but remains dependent on Russia for aid and investment. Many Armenians accuse the government of corruption and mishandling the economy. This story was written by Reuters.